Got Compliance? Providers enrolled in Medicare, including therapy practices, are required under the Affordable Care Act to have a compliance program in place. * While CMS has yet to publish specific guidance on compliance program requirements, the OIG has continued to emphasize that implementation of a compliance program using one of the OIG Compliance Program Guidances is best practice. 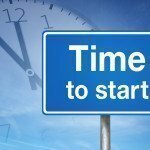 Does your practice have a compliance program? Is it written down? Help is on the way! 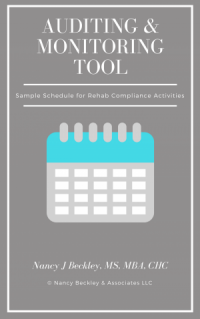 This Compliance Program Guide was developed by Nancy Beckley over 10 years ago specifically to assist clients in developing a compliance program. Until now it was only available as part of a consulting package for compliance program implementation. Now it is available to all providers to assist in customizing and implementing compliance program requirements. 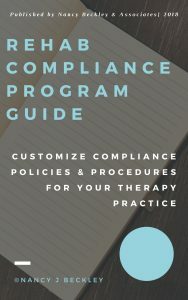 Join our Gold Membership level designed to provide compliance resources and compliance tools specific to therapy providers. Gold “Compliance” subscribers receive a 25% discount on this customizable Compliance Program Guide. *Section 6401 of the Affordable Care Act provides that a “provider of medical or other items or services or supplier within a particular industry sector or category” shall establish a compliance program as a condition of enrollment in Medicare, Medicaid, or the Children’s Health Insurance Program (CHIP).